What Makes Safety Pays Different? 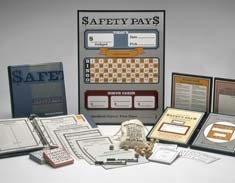 Unlike most safety incentive programs, Safety Pays was developed strictly as an in-house program at one of the nation’s leading seafood processing & distribution companies. It was so successful, other companies in the fish business wanted to learn how their companies could use it too! Within just a year or two, our safety incentive approach became a nationwide tool thanks to the value it delivered. Safety Pays does not advertise or market the program/services we provide. Our success is based almost entirely on word-of-mouth from thousands of satisfied customers. A “turn-key” system assuring minimal administration alongside maximum motivational effectiveness. Easy Implementation & Administration: Safety Pays provides multiple levels of program implementation assistance including on-line Orientation videos here on our website, individual employee Rules & Regulation hand-outs, Administrative Guidelines with plenty of tips & suggestions, and a Program Checklist for quick and easy reference. Still have a problem? Call our toll-free customer service center or on-line help desk any time for immediate assistance! Full Customization: Our program inherent flexibility allows a company to address not just workplace safety but virtually any human resource issue that carries a hefty price thanks to employee noncompliance. Safety Pays can be expanded to encompass areas such as attendance, housekeeping, error-reduction, productivity, Q/A, etc. Bilingual Option: All of the employee components are also available in Spanish in matching quantities to the English versions. Free Upgrades: When you buy Safety Pays, you are not just purchasing the best safety incentive system available, but also the support to ensure long-term program success. This includes upgrade tools and ideas to keep the program fresh and dynamic. Unlimited Customer Service: Safety Pays is not just a product but a service. In subsequent months after implementation, we remain available to assist with any needed fine-tuning in order to get the most out of our safety incentive program’s design.